Liverpool Beatles Auction: Stopped Mid-Signing! Some autographs have interesting tales behind them. In this case the person trying to obtain the autographs was on the same train as the Beatles. 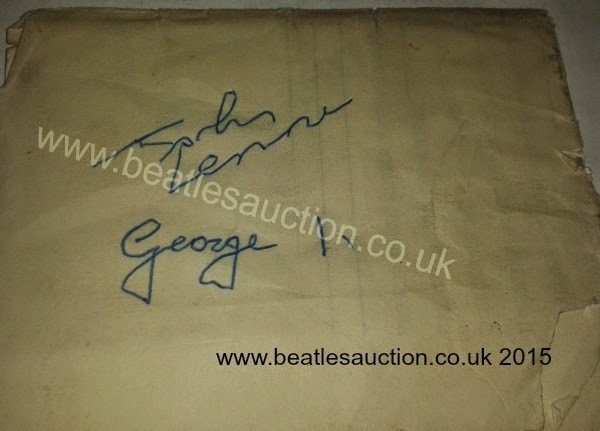 They managed to get John's full signature but they were ushered out of the carriage in the middle of George signing his name! The vendor has provided a letter to go with this lot explaining what happened on the day and they are expected to fetch between £500-£600 when sold in our Liverpool Beatles Memorabilia auction in August.